Being well equipped for camping trips is essential. Nothing is worse than being ill prepared for roughing it in the wilderness. What’s more, you need to have a proper shelter. Something that stands up to the elements you’ll be facing. And, something that keeps you comfortable for a good night’s rest. There’s a ton of options you can choose from for camping tents. But, for camping in larger groups, there are less options. Things can get expensive and complicated fast. How much square footage you will need and how to cram a whole group of campers in one space, is difficult. So, we’re going to help you navigate this problem. We’ve selected some of the best 12 person tents currently available. We’ve set them up side by side and given you a breakdown of the specs. From how many room dividers you’ll need, to the security of waterproofing, we’ve run all these selections through the ringer. You’re going to be spending a little bit of money for this family investment. Because of that, we’ve tried to keep the cost down while keeping the quality high. Our general philosophy here is: If it’s a feature worth paying for, we’ll include it. If it’s something that is hiking up the cost and doesn’t offer much, we’ll leave it behind. That said, roominess and comfort are the name of the game here. You want to sleep well and wake up rested to take on a day of hiking or family fun. For that to happen, you need something that feels like a home away from home. Let’s take a look at some of the best options available for housing larger groups on your next camping trip. Amazed by the size of the tent? 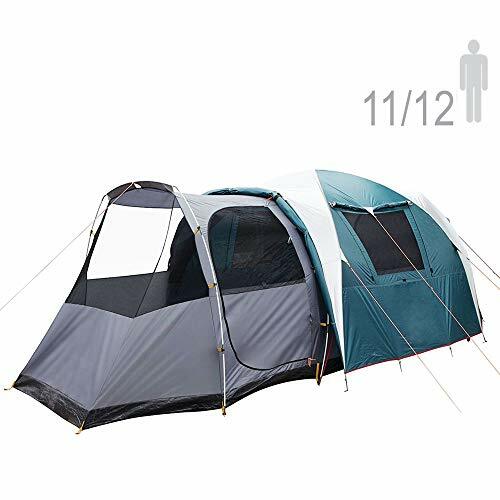 It’s not surprising why these tents are often referred to as “portable houses”. Though important, size is not the only reason why these tents have garnered such great reviews from customers. These tents come with instruction manuals that will guide you to setting up in less than 2 minutes! They can also comfortably fit 3 queen-size airbeds and easily host 12 people. As you can see, this tent is amazingly spacious and it feels more like a 3-room apartment rather than a tent. And the best thing about it? It’s super affordable. If you are lucky enough and find a promotion on it, you can scoop it for less than $300, an absolute steal of a deal. 2 doors and 3 windows. Super comfortable 6.9 height ceilings. A compact and comfortable solution to camping in a larger group is the NTK Super Arizona. Firstly, this design is fully waterproof, which is a must. Second, there is a room divider. And, anyone who has been on long camping trips with groups knows this comes in handy. Additionally, with two doors and three windows, you won’t feel claustrophobic. Another great feature of this one is how waterproof it is. Nothing is worse than waking up wet because the tent said it was waterproof and it isn’t. This one will keep you dry even in some pretty heavy rain. Because of the double layer 190T polyester that lines the roof, you’ll be protected. Furthermore, there is another layer of laminate to create a 2500mm polyurethane water column. Additionally, with an aluminum alloy in the mix and heat welded PU seam seals, things will be climate controlled and dry as a bone. Add to that extra UV protection and you have a home away from home. Another convenience is that the poles are color-coded. Because of this, the traditional headache of getting a tent ready, is a thing of the past. Finally, for the flooring, a seamless anti-fungal bathtub style lines the bottom. That’s a really great feature, considering one of the major complaints with tents in waking up in a puddle. Room divider for added privacy. Extremely water proof with double lining and heat welded PU sealed seams. UV protection for comfortable climate-controlled sleeping. Bathtub style antifungal flooring for extra dry foundation. This one runs a little expensive, although we think the specifications justify the hefty price tag. With water proofing for extra dry performance and ample standing room, the NTK Super Arizona is a great choice. Though it’s slightly more costly than some competitors, the excellent features explain the price. This one will keep the whole family comfortable and warm, even in poor conditions. Large vestibule with fly canopy extension porch. A good choice for mild to slightly rainy weather is the Tahoe Gear Carson. Comfortably fitting a party of 14, this tent is ample. With ceilings tall enough for almost anyone to stand, it’s basically a miniature house. Though the tent is not completely waterproof, in most conditions this one will stay nice and dry. What’s more, three rooms can be joined or divided depending on preferences. This means sections of families can have privacy. Also, it includes a nice extended canopy over the door. This creates a cozy vestibule that can be used as a porch. The entire tent is manufactured using a heavy-duty 1000mm polyester material. 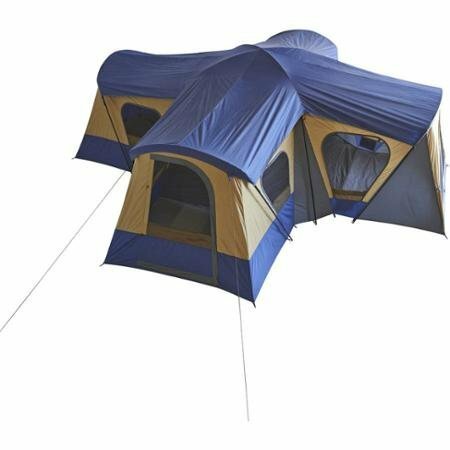 During normal use, this tent will stand up against rips and tears. Because of the ample space, this is our top choice for festivals where extreme weather is not a concern. 7’ tall ceilings allow you to actually walk around. Extension canopy creates vestibule porch. 3 rooms which can be joined or divided as necessary. For the price, we think this one should be completely waterproof. Might be overkill for certain situations when there is not enough setup room. One of the most roomy tents we’ve reviewed, the Tahoe Gear Carson is an awesome choice for larger applications. Since it has internal dividers, this is great choice for families that want a little privacy. In addition, the front vestibule is a cool feature that many competitors don’t include. Polyester material with taped fly seams to prevent moisture. 4 rooms that are divisible to customize interior. Square walls provide ample 235 interior square footage. Floor Size 20 x 20 feet. 4 doors for separate exits. 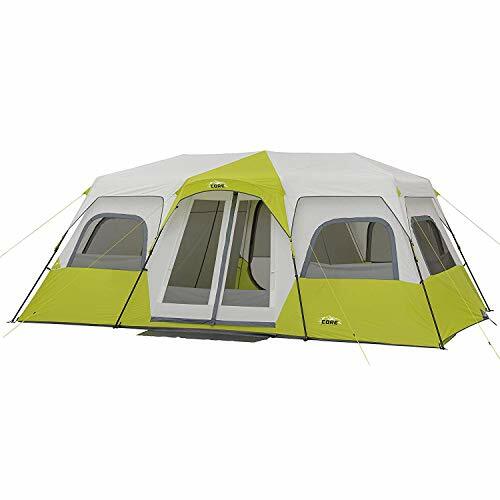 The Ozark Trail Base Camp is an ample and robust tent. Sleeping up to 14 campers, this one is like a small house. And, because the walls are 90-degree angles, you get the maximum interior square footage. In fact, you get a total of 235 square feet. That’s impressive. You can join or separate the 4 interior rooms. Because of this, each room division includes its own exit. This makes the Ozark a great choice for large families or groups requiring more privacy. What’s more, you can customize the internal rooms to any denomination. In fact, you can build 1-4 rooms based on the included configurations. 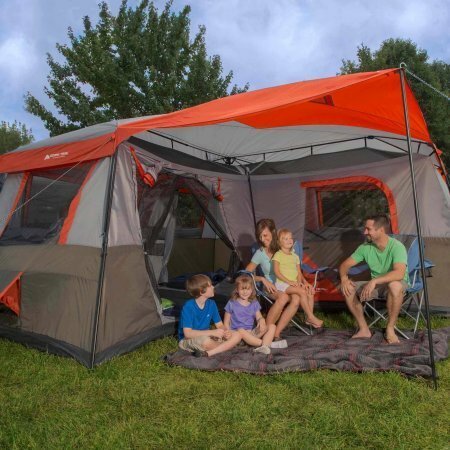 Because of this, this is our top choice for multiple families camping together. Additionally, small and smart conveniences add a lot. For example, the e-port that provides quick access to extension cords for powering appliances inside. Furthermore, with 12 windows and a center height of 78-inches, there’s plenty of air. In fact, when inside this tent, this is one of the most comfortable interiors we’ve come across. If roominess is a concern for your next camping trip, the Ozark might be a perfect choice. Ample interior space with 235 square feet. Squared wall allow for maximum standing room. Can comfortably hold 14 campers. Divisible to 1, 2, 3 or 4 rooms. This tent is rated for 3 seasons. That means it’s not the one you want to take into the dead of winter. All in all, a great choice for larger camping groups, for 3 seasons the Ozark stands tall. That said, this is not built for extreme weather conditions. Still, if conditions permit, this is one of the roomiest interiors we’ve seen thanks to the 90-degree walls. 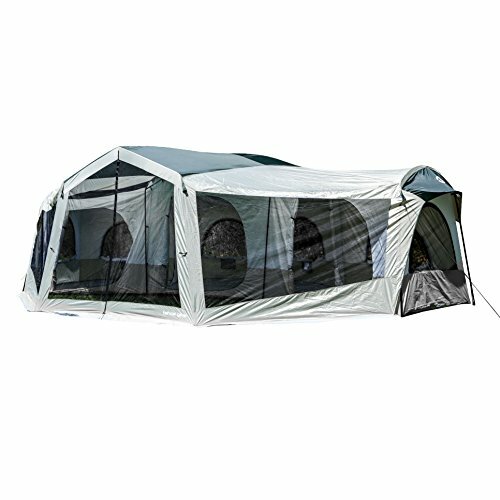 With an instant 2-minute setup, this tent comfortably hosts 12 people and 3 queen air mattresses easily. It is equipped with an adjustable ground vent for firm grip and an 80” high center feature. In addition, it comes with two room dividers that make it easier to create three separate rooms inside. It is also equipped with a cargo hold for camping items, and an access port for electrical cords. These cords can be perfectly safe-guarded when not in use. To generate energy for these features, we recommend you take a look at our list of the best portable solar panels. This tent is easy to set up, thanks to a clear and concise tutorial. It has enough space for 12 people and it has a one-room divider. If utilized, it creates two rooms that both have large windows with mesh screening. 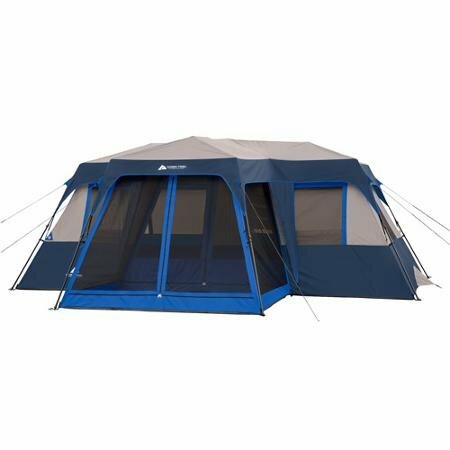 It also has a large open front screening to view the outdoors without leaving the tent itself. It also has holding spaces for travelers to store their personal items. So, now that we’ve reviewed some of the best 12 person tents, we think you’ll be better informed when making your purchase. Keep in mind, there’s some cool features with some gear that aren’t necessary, but nice to have. For example, the canopy vestibule on the Tahoe Gear Carson. This a great addition, but not necessary for camping well. Still, it’s an awesome feature to wake up to while you enjoy your morning coffee. The interior sizing of the tent is probably the most important thing here. The height of your campers and their ability to stand comfortably inside, is a huge plus. Keep in mind, a 12 person tent is essentially a portable house. Therefore, anything you can do to make people feel more at home, will help everyone enjoy their trip. The great part about these reviews is that they are all excellent choices. We’ve tested these products and spoken with customers who use them. Because of this, if you’re on a budget, any one of these will provide a great camping experience. Another important thing to keep in mind here, is whether you’ll be camping in the winter. This will narrow your choices quite a bit. The NTK Super Arizona is a killer choice for waterproofing. You’ll enjoy the sound of rain, and even light snow, knowing that you’ll wake cozy and dry. Take your time and review the specs before deciding. And, most importantly, be safe and have fun on your next family or group adventure. We know you’ll be resting a little more comfortable this time around.